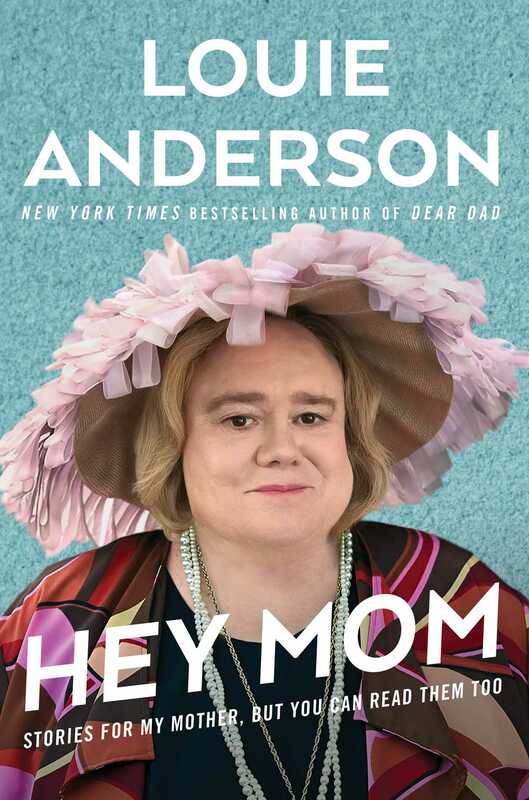 With wry wit and poignant humor, Louie Anderson, New York Times bestselling author and Emmy Award–winning comedian currently starring in Zach Galifianakis’s Baskets, shares his journey of turning life’s challenges into joy, as well as plenty of wisdom he’s still discovering from his late mother. Louie Anderson has channeled his beloved mom in his stand-up routine for decades, but she died before seeing him reach his greatest heights, culminating in his breakout TV role as Christine Baskets, the mesmerizing character inspired by his mom, Ora Zella Anderson. This book is Louie’s way of catching her up on his triumphs, disappointments, and continuing challenges. There is heartache, but also great hope. There are also—given Louie’s inimitable voice—laugh-out-loud stories and observations on life’s absurdities, the kind only he could make. I already talk about you a lot but lately I’ve been speaking to you directly, too, so I figured it was time I wrote. I often wonder how you’re doing. Is there an afterlife? Heaven? That’s the million-dollar question. Or billion-dollar question. Or in this day and age, I guess the trillion-dollar question. A million’s not even a million anymore. A million was really a million back in your day, Mom. I could say I’m writing now to tell you about this great role I got in a great TV show, which just got “picked up,” in which I play a mom—that’s right, Mom, a mom, not a dad—of four grown sons, and the character is so much like you! Her name is Christine Baskets and playing her comes so naturally because I keep channeling you. What would Mom say? What would Mom do? What would Ora Zella Anderson do? So of course I want to let the inspiration for the character know about it, even if she died a quarter-century ago. But that’s not the only reason I feel the need to write. I have so many questions and so many things I’ve been meaning to say to you. Stuff that’s on my mind a lot, and I wanted to get it down someplace. There were questions I neglected to ask Dad when he was still around but that’s easier to explain. There were so many things he wouldn’t talk about. He was angry, an angry alcoholic. Sometimes I just didn’t want to be around him, and neither did any of your other ten children. But why didn’t I ask you the things I want to ask you now, back when I had the chance? You had no trouble talking, Mom. “Blah, blah, blah,” Dad said many times about your “going on.” I’m so much more like you than him, in that way. You never yelled or punished or expressed disappointment, only love. Sometimes I wish you’d been harder, more disapproving. Maybe you were and I didn’t notice. Anyway, it kills me that I didn’t ask you a bunch of things I think about more and more these days. I often think about childhood and our family and the things that make us who we are. I’ve always thought about that stuff. You know this, Mom, but so much of my comedy act over the years has been based on our family, and you, and what growing up was like. That was a lot of my best material, still is. As a young comic, I mostly made fat jokes at my own expense, or maybe I should say I did lots of fat jokes about this fat character I played onstage (though I played a fat person offstage, too). That was the common denominator. But it’s come to be less of my act. Maybe it’s because I don’t see myself anymore as a fat person but a person who happens to be fat. Anyway, you were still around when I was doing material about family and it always got laughs, but then I got a little darker and maybe more real with it, and got some of the biggest laughs of the set. A different kind of laugh. It opened up something in me and I started digging. Roman DiCaire, an older comedian I admired and who saw me perform, told me, “Louie, if you do that material about your family and have a completely clean act, you’ll be famous.” I lacked direction then and I was looking for someone to tell me something. He turned out to be 100 percent right. Decades later, Mom, I make jokes about the family, and they land, and land hard, because they’re so true for everyone, though I still think our family was way more screwed up than most. “A stress test—you know what that is? It’s where you have your whole family over to the house.” Stuff like that often gets the most unguarded laugh of the night. So here I am, Mom, on the verge of basically playing you for a national TV audience, with the pursed lips, the disapproving judgmental glances—in the nicest way—that I picked up from you. You know that side glance that could say a million things—Don’t do that, Put that down, What are you doing? Don’t make us look bad, Oh, Louie . . . ? That’s there. Yet even though I understand some things about you and me, I want to understand more. I think we all do a subconscious “Hey Mom” a lot of the time. I guess I must believe in the afterlife if I’m writing to you and I talk to you and my face is always turned up to the sky. If there is an afterlife, I hope there’s a big comfortable chair, because I know you like that, and good creamer for your coffee, and a TV showing old reruns. The last time I had a moment like this, where I absolutely needed to write down what was on my mind, was 1987, when I was touring the Midwest and doing Summerfest in Milwaukee. Thousands and thousands of people were taking in the different acts, drinking beer, eating bratwurst. When my set was over, I wanted to head back to the hotel, so I got a lift from a festival volunteer. I climbed into the back seat of the car—a Buick. Mom, you always loved Buicks, such big beautiful cars. All around us were so many drunks wobbling and staggering to their cars, then getting into their cars and trying to avoid hitting other drunks. My first thought was amazement at the inner gyroscope of drunks, how the alcohol takes over and they look like they’re going to fall over but somehow they don’t—amazing! A lot of them, mostly men, made wrestling noises. Ooo! OOOOO! But I had a bigger thought: The whole scene was a metaphor for my life, me swerving and trying to avoid the damage that alcohol did to me, did to all of us, does to all kinds of people. That it did to you, Mom, though you yourself hated to drink. As soon as I got to my room at the Pfister Hotel, a beautiful old hotel in Milwaukee that’s supposedly haunted, I sat down at the desk, just like I’m doing here with you, and I wrote a letter to Dad. He was already seven years dead at that point, and it all just spilled out of me, letter after letter in my journal, and I kept writing, and crying, in search of some better understanding, any understanding, for why Louis William Anderson was such a cruel, difficult alcoholic father. Those letters eventually got collected into a book, Dear Dad: Letters from an Adult Child, that you got to see, Mom, but just barely, because you died without warning a few months later. Like I said, so much has happened since then, and I want to keep you up-to-date. I wish you had seen the professional success I’ve enjoyed in the twenty-five years since you died. You deserve a lot of the credit, partly because I talk so much about you and the family in my act, partly because of the reservoir of love and kindness you doled out to me and to all of us, which gave me the strength to not quit. Because you never quit, never gave up, never gave in, always put one foot in front of the other. In a couple years it will be forty years for me as a stand-up comic. A clown, really, but a clown who’s making good money. Can you believe that, Mom? Forty! Anyway, I could not have gotten this far in my career if I gave up easily. Dad was also stubborn. All us Andersons are. We won’t give in, we won’t give up, we won’t even take care of ourselves. There are other things I wish. I wish I would have had you come live with me later in life. I wish I’d been more open to the idea. I know you would have adored that. I would have, too, eventually. I was selfish then, much more than I think—I hope—I am now. I wish I would have done it and I’m glad to say it here even though it’s too late. I also know we have to let go of regrets or it drags us through the mud for all the things we didn’t do. I need to tell you about the family—but it’s late and I’m wiped out from the show, so I’ll say good night for now. I’ll write tomorrow.